This chapter examines the methods by which neoliberal ideas and practices were consolidated in Hungary between 1990 and 2006, as well as the variegated impact of neoliberal restructuring on society. Challenging accounts of neoliberal transformation as a relatively harmonious process, the chapter argues for a more critical understanding of this process, which stresses the importance of both economic and political coercion, as well as the extensive investment in the ideological underpinnings of neoliberalism by both external organisations, such as the International Monetary Fund (IMF) and the World Bank, the European Union (EU), the United States Agency for International Development (USAID), multinational corporations (MNCs), and neoliberal think tanks, and domestic economic and political elites. 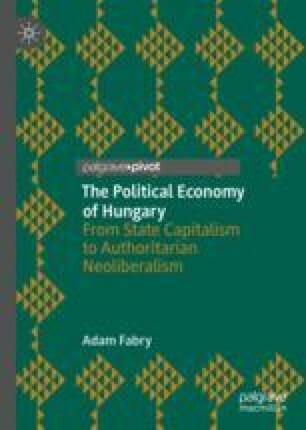 Analysing the politico-economic trajectory of Hungary from 1990 to the mid-2000s, the chapter shows that, although the country did become a ‘poster boy’ of neoliberal transformation in the region, its emergent regime of accumulation was fraught with contradictions and limitations. These limitations were revealed during the massive anti-government protests that rocked Hungary during the autumn of 2006. ‘A Széles-birodalom’. (2005, October 9). 24.hu. Retrieved March 13, 2018, from http://24.hu/fn/gazdasag/2005/10/09/szeles_birodalom. ACEA. (2008). Country Profile: Hungary. European Automobile Manufacturers Association (ACEA). Retrieved from http://www.acea.be/uploads/press_releases_files/20081104_Hungary_country_profile.pdf. Antal, L. (1995). A Bokros-csomag. Beszélő, 5(5). Retrieved March 10, 2019, from http://beszelo.c3.hu/cikkek/a-bokros-csomag. Avery, N. (1993, September). Stealing from the State. Multinational Monitor. Retrieved January 9, 2013, from http://multinationalmonitor.org/hyper/issues/1993/09/mm0993_10.html. Dimireva, I. (2009, October 29). Hungary Investment Climate 2009. EU Business. Retrieved June 8, 2010, from http://www.eubusiness.com/europe/hungary/invest. Ernst & Young. (2013). The Central and Eastern European Automotive Market: Hungary. Retrieved July 31, 2013, from http://www.ey.com/gl/en/industries/automotive/the-central-and-eastern-european-automotive-market%2D%2D-country-profile%2D%2Dhungary. ETUI. (2016). Hungary: Trade Unions. European Trade Union Institute (ETUI). Retrieved April 24, 2018, from http://www.worker-participation.eu/National-Industrial-Relations/Countries/Hungary/Trade-Unions. Eurostat. (2018). Eurostat Statistical Database. Retrieved April 18, 2018, from http://ec.europa.eu/eurostat/data/database. ‘Excerpts: Hungarian “lies” speech’. (2006, September 19). BBC News. Retrieved July 21, 2016, from http://news.bbc.co.uk/1/hi/world/europe/5359546.stm. ‘History of the Hungarian American Enterprise Scholarship Fund’ (HAESF). (2013). Retrieved November 27, 2013, from http://www.haesf.org/about_haesf/history.html. ‘Hungary: Situation of Roma’. (2012, July 13). Refworld (UNHCR). Retrieved August 19, 2016, from http://www.refworld.org/cgi-bin/texis/vtx/rwmain?page=search&docid=5036010888&skip=0&query=Roma&coi=HUN&querysi=situation%20of%20Roma&searchin=title&sort=date. ‘Médiabirodalmat épít Széles Gábor’. (2005, September 15). Index.hu. Retrieved March 13, 2018, from http://index.hu/gazdasag/magyar/szelm050915. Piketty, T. (2018, January 16). 2018, The Year of Europe. Le blog de Thomas Piketty. Retrieved April 4, 2018, from http://piketty.blog.lemonde.fr/2018/01/16/2018-the-year-of-europe. ‘The MMI Top 50 for 2017’. (2017). Retrieved March, 13 2018, from https://mfgmkt.com/httpsmfgmkt-comwp-contentuploads201704top-50-ems-companies-2016-pdf. VIDEOTON. (n.d.). Record Income in the Life of Videoton Holding. Retrieved May 28, 2018, from http://www.videoton.hu/index.php/en/news/headlines/150-record-income-in-the-life-of-videoton-holding.